PLEASE NOTE: This site is NO LONGER BEING UPDATED! We have received word from Cisco that they no longer wish to continue this project on MetaLab. 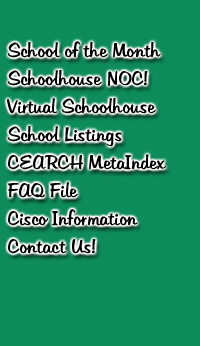 They say they are going to establish a Cisco-hosted educational site; please check their site for more information. Otherwise, all of the content material remains accessible for the time being. Please use it with the caveat that links may have changed, sites been moved and material become out-of-date. We would like to thank those who have used CEARCH in the past and found it useful, and those who have contributed to it and made it thrive. Thanks! Greetings to first-time visitors and welcome back to those of you who have been here before. On the left is a listing of the most frequently visited areas in CEARCH to aid you in your navigation. Our site is an index of original content material, links, and user-submitted information which we hope will provide today's educators with a resource for their classrooms, for their schools and for their communities. Cisco Information | Contact Us!